Is it a bird, is it a plane, not it’s super-Steve!! Marsh that is. 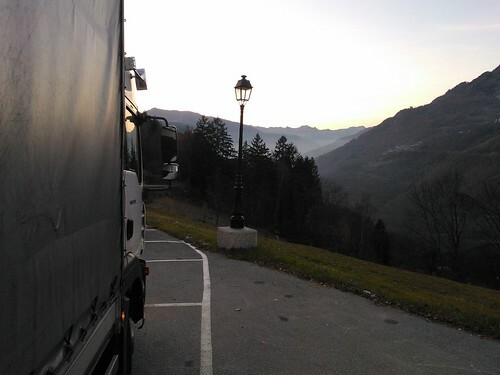 Back in November your friend and mine, Steve Marsh Express was asked to transport some art, modern art, down to an exhibition in Courchevel 1850, France. Courchevel I hear you repeat to yourself, yes Courchevel its that rather exclusive ski resort in the French Alps. 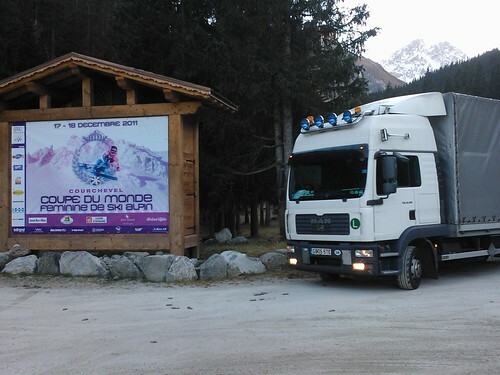 Marshy got the call to transport the sculpture work of artist Mauro Perucchetti, to the Courchevel Festival. Mr Marsh sent me some snaps of the stunning scenery but none of the cargo, so he described it as “Batman/Superman & Jelly Baby statues.” Not really knowing what Marshy meant by Jelly Baby statues I had to have a look for myself and sure enough they can only be described as the aforementioned Jelly Babies. This modern art stuff can be strange can’t it? There is pretty well nothing that can’t be classed as art. Personally I like a good old piece of picture art, nice scenery, good composure, some good detail and of course an ideal subject. Something like this works well……….. If my idea of art is not the same as yours perhaps the press release for the exhibition is more your thing. When you can, have a look through the gallery on Mauro Perucchetti’s website, you can see the Jelly Baby sculptures. If you look hard enough you’ll see a white marble carved sculpture of Batman and Superman, which actually is quite good, I like it. Anyway this isn’t weirdartblog.com.org so i’ll leave the opinions of modern art to those who claim to know what they are talking about! Stunning views those mountains, quite steep too some of them, they look great as a backdrop for the little MAN. Come snow or shine Marsh’s little MAN seems to cope. So after unloading his arty farty load, it was time to head off to the reload. This time Switzerland was the loading point. 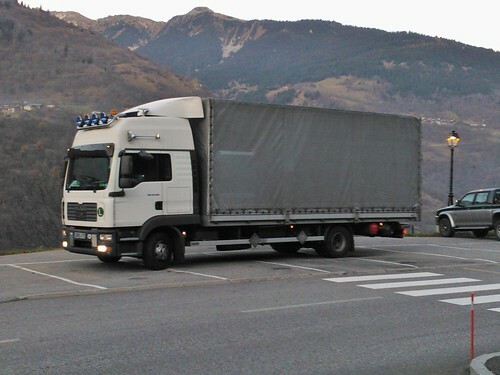 340 ish kilometres from Courchevel to Niederbipp, CH. The load was some tools and machinery GB05 STE had delivered out to Niederbipp two weeks earlier. They had been used to repair some machines at a papermill, but now had to be returned to Darwen, Lancashire. All in all another good trip for us to marvel at (ref to superheroes I think you’ll find!). Hopefully if you click HERE you can see a Google map of the trip. I thought i’d give it a go and see if it works. For now i’ll leave you with Mr Marsh heading off into a mountain filled sunset, until the next time……………………. Italy, France and Ireland next. 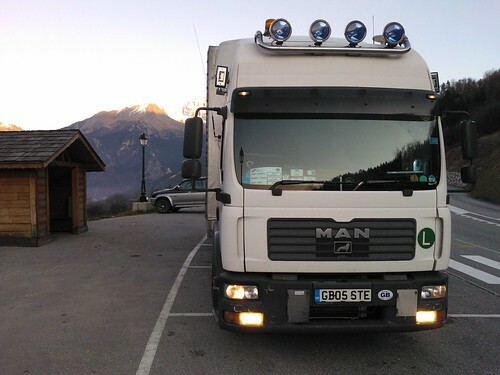 This entry was posted in Drivers Photos, International Mega Trucking, MAN, Steve Marsh Express by truckbloguk. Bookmark the permalink.